1 Department of Anesthesiology, School of Medicine, Keio University, Tokyo. 2 Department of Medicine, Keio University Tsukigase Rehabilitation Center, Shizuoka. 3 Department of Anesthesiology, Kitasato Institute Hospital, The Kitasato Institute, Tokyo. 4 Department of Physiology, School of Medicine, Teikyo University, Tokyo, Japan. Morphine is often used in cancer pain and postoperative analgesic management but induces respiratory depression. Therefore, there is an ongoing search for drug candidates that can antagonize morphine-induced respiratory depression but have no effect on morphine-induced analgesia. Acetylcholine is an excitatory neurotransmitter in central respiratory control and physostigmine antagonizes morphine-induced respiratory depression. However, physostigmine has not been applied in clinical practice because it has a short action time, among other characteristics. We therefore asked whether donepezil (a long-acting acetylcholinesterase inhibitor used in the treatment of Alzheimer's disease) can antagonize morphine-induced respiratory depression. Using the anesthetized rabbit as our model, we measured phrenic nerve discharge as an index of respiratory rate and amplitude. We compared control indices with discharges after the injection of morphine and after the injection of donepezil. Morphine-induced depression of respiratory rate and respiratory amplitude was partly antagonized by donepezil without any effect on blood pressure and end-tidal C02. In the other experiment, apneic threshold PaC02 was also compared. Morphine increased the phrenic nerve apnea threshold but this was antagonized by donepezil. These findings indicate that systemically administered donepezil partially restores morphine-induced respiratory depression and morphine-deteriorated phrenic nerve apnea threshold in the anesthetized rabbit. Key terms: morphine, donepezil, rabbit, respiratory depression, Alzheimer's disease, cholinesterase inhibitor. Morphine is the mainstay of cancer pain and postoperative analgesic management, but its side effects can limit dosage and reduce quality of life (Bowdle 1998; Chaney 1995; McNicol et al., 2003). Respiratory depression is potentially the most serious side effect induced by morphine and is of great concern to physicians (McNicol et al., 2003). This morphine-induced side effect can be treated with naloxone, an opioid receptor antagonist, but naloxone also inhibits morphine-induced analgesia (Bowdle 1998). Therefore, anesthesiologists and pain clinicians seek new therapeutic strategies that can antagonize morphine-induced respiratory depression. Numerous articles have proposed various candidates as antagonistic drugs for opiate-induced respiratory depression (Weinstock et al., 1980; Weinstock et al., 1981; Weinstock et al., 1982; Snir-Mor et al. 1983; Willette et al., 1987; Elmalem et al., 1991; Berkenbosch et al., 1994; Ballanyi et al., 1997; Owen et al., 2000; Manzke et al., 2003; Lalley, 2004; 2005). However, none of these have been applied to clinical practice thus far because most are experimental chemicals. Among these candidates, only physostigmine, an acetylcholinesterase inhibitor, is clinically used and can antagonize opiate-induced respiratory depression (Weinstock et al., 1980; Weinstock et al., 1981; Willette et al., 1986; Snir-Mor et al. 1983; Berkenbosch et al., 1994). Acetylcholine (ACh) is an excitatory neurotransmitter in central respiratory control (Murakoshi et al., 1985; Monteau et al., 1990; Burton et al. 1995; Shao and Feldman, 2000, 2001, 2002, 2005; Sakuraba et al. 2003), including central chemosensitivity (Monteau et al., 1990; Burton et al. 1997; Eugenin and Nicholls, 1997; Eugenin et al., 2001; Okada et al., 2001; Sakuraba et al. 2005) and opiates can inhibit the release of ACh from neurons in the central nervous system (Jhamandas et al., 1971; Domino and Wilson, 1973; Zsilla et al., 1977). However, physostigmine has numerous disadvantages, e.g. relatively high toxicity (Christie et al., 1981), low chemical stability and short duration of action (Elmalem et al., 1991). Neostigmine, another commonly used acetylcholinesterase inhibitor, does not penetrate the blood-brain barrier (Padmanabha Pillai et al., 1982). A long-acting acetylcholinesterase inhibitor that can pass the blood-brain barrier might become one of the candidate drugs for reversing opiate-induced respiratory depression. Donepezil, a widely used Alzheimer's disease drug, is a long-acting synthetic drug designed to selectively and reversibly inhibit acetylcholinesterase (Smith Doody 2003). Furthermore, it easily penetrates the blood-brain barrier and targets the brain. Therefore, we hypothesized that donepezil would reverse morphine-induced respiratory depression in the anesthetized rabbit. This study was conducted in accordance with a protocol approved by the Animal care and Use Committee of Teikyo University School of Medicine. The experimental procedure has been described in detail elsewhere (Kuwana and Natsui 1981; Okada et al 2004). Briefly, 26 healthy rabbits (Japanese White, male, Sankyo laboratory, Tokyo, Japan) weighing 1.9-2.7 kg (average, 2.3 kg) were anesthetized by intravenous administration of 40 mg/kg chloralose and 200 mg/kg urethane (Wako Pure Chemical, Osaka, Japan) after intraperitoneal administration of 10 mg/kg ketamine (Sankyo Pharmaceutical, Tokyo, Japan). In the preliminary study, these anesthetics did not change respiratory activity during 3 hours in the same conditions of the present study. In our previous study, the combination of chloralose and urethane could maintain a stable depth of anesthesia for over 8 h (Okada et al. 2004) and no experiment lasted more than 3 h in this study. After anesthesia was performed, each rabbit was placed in a supine position on an electrical heating pad, and the rectal temperature was maintained at 37-38 °C. The trachea was cannulated in the mid-cervical region for artificial respiration and there was continuous monitoring of the end-tidal C02 with a gas analyzer (Respina 1H26, NEC San-Ei, Tokyo, Japan). The right femoral artery and vein were catheterized for arterial blood pressure measurement and intravenous injection. After preparatory nerve surgery, the vagus and aortic nerves were cut bilaterally at the mid-cervical region. Muscle paralysis was induced with 0.2 mg/ kg pancuronium bromide (Sankyo Pharmaceutical, Tokyo, Japan) injected into the right femoral vein, and artificial ventilation with room air was initiated. Thereafter, the same dose of pancuronium bromide was administered hourly. The end-tidal C02 was maintained within 35 ± 3mmHg by adjusting the ventilation (Kuwana and Natsui, 1981). Phrenic nerve discharge was used as the index of central respiratory output (Kuwana and Natsui, 1981). The right phrenic nerve was sectioned at the low cervical region and its central cut end was placed on a bipolar platinum electrode in a pool of liquid paraffin. The phrenic nerve discharge was amplified with an AC amplifier (AB651J, Nihon Kohden, Tokyo) and passed through a band-pass filter (50Hz-3kHz). It was then half-wave rectified and integrated with a time constant of 100 ms with a signal-integrator (EI601G, Nihon Kohden, Tokyo). Signals of raw phrenic discharge, integrated phrenic output, end-tidal C02 and arterial blood pressure were recorded with a thermal array recorder (RTA-1200M, Nihon Kohden, Tokyo) and stored with a digital tape recorder (RD-135T, TEAC, Tokyo) for subsequent analysis. At about 30 min after surgery, respiratory rate (/min) and respiratory amplitude (height of integrated phrenic output) were measured to provide control or baseline indices. They were also measured at 10 min after 2 mg/kg morphine was injected intravenously over a period of 1-2 min. Then, after the signal became stable, 4 ml/kg saline (n=3) or 400 ug/kg donepezil (n=14) was injected and both indices were also measured 15 min after the injection of these drugs. In 6 rabbits, apneic threshold PaC02 (mmHg) was determined at control and 10 min after injection of morphine and donepezil. The procedure for determination of apneic threshold PaC02 has been described in detail previously (Kuwana and Natsui 1981). Briefly, successive increments in ventilatory magnitude resulted in a gradual decrease in PaC02, followed by gradual suppression of phrenic nerve activity. After phrenic nerve discharge disappeared completely, arterial blood was sampled from the femoral artery and PaC02 was measured by capnogram. This PaC02 value was designated the apneic threshold PaC02. Respiratory frequency and respiratory amplitude after injection of morphine and after injection of saline or donepezil were both analyzed using a paired t-test. Apneic threshold PaC02 at control, 10 min after the injection of morphine and at 15 min after the injection of donepezil were analyzed using one-way ANOVA with Bonferroni/ Dunn post hoc test. P < 0.05 was considered significant. Data are expressed as mean ± SD. Fig. 1 shows a typical recording of morphine-induced respiratory depression and the antagonistic action of donepezil. Morphine (2mg/kg) depressed the respiratory rate and respiratory amplitude (Fig. 1A). Average respiratory rate obtained from 17 rabbits was 89.9 ±3.9 /min at control and significantly decreased to 30.2 ±5.6 /min after morphine administration (P < 0.001). The amplitude of integrated phrenic nerve activity decreased to 50.9 ± 8.7 % of control (P < 0.001). Minute phrenic activity (respiratory rate x amplitude) decreased to 20.0 ± 8.7 % of control (P< 0.001). 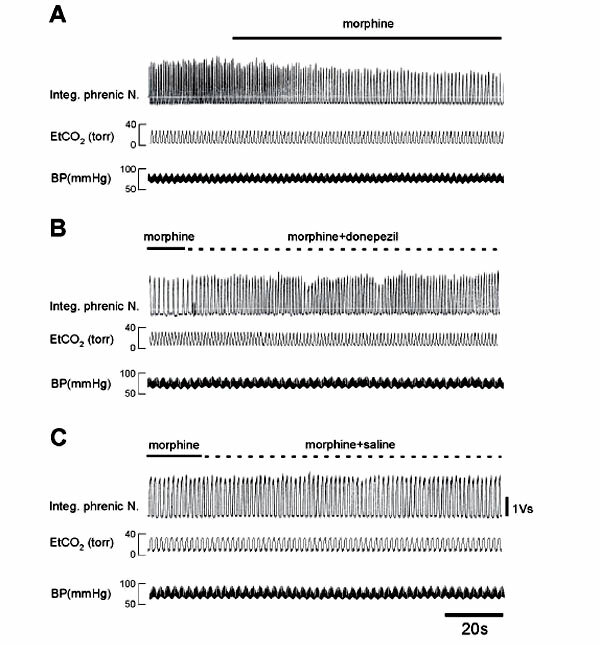 Figure 1: Representative recording of integrated phrenic nerve activities showing effects of morphine (A) on control condition and also showing effects of donepezil (B) or saline (C) on morphine-induced respiratory depression. End-tidal CO2 (EtCCO2 ) and blood pressure (BP) were continuously monitored, and are presented at the bottom of the figure. 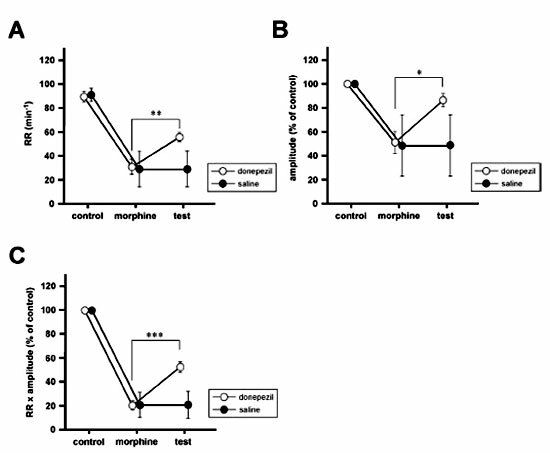 This morphine-induced respiratory depression was antagonized by donepezil (Fig. 1B). Donepezil (n=14) induced significant increments in (a) respiratory rate to 55.6 ±3.6 /min from 30.4 ± 6.3 / min (Fig. 2A; P < 0.0003), in (b) respiratory amplitude to 82.3 ± 3.4 % of control from 51.3 ± 9.5 % (Fig. 2B; P < 0.002), and in (c) minute phrenic activity to 52.6 ± 4.3 % of control from 20.3 ±3.7 % (Fig. 2C; P < 0.0000006). On the other hand, injection of saline (n=3) did not induce any change in phrenic nerve activity (Fig. 1C, Fig. 2). During the experiments, blood pressure and end-tidal C02 did not change significantly. Apneic threshold PaC02 is a useful reference for respiratory activity. Morphine significantly increased the phrenic nerve apnea threshold (P < 0.05) but this was significantly antagonized by donepezil (P < 0.05) (Fig. 3). The present study revealed for the first time that systemically administered donepezil, an acetylcholinesterase inhibitor, partially restores morphine-induced respiratory depression and morphine-induced deterioration of phrenic nerve apnea threshold in anesthetized rabbit. Donepezil is a reversible inhibitor that exhibits high specificity for centrally active acetylcholinesterase and raises ACh levels in the brain (Rho and Lipson, 1997; Rogers et al., 1998). Because it is administered orally in clinical practice and in most previous experiments, we could not obtain information regarding how much intravenously administered donepezil induces significant increases in ACh levels in the brain. However, there is at least one previous study investigating quantitative dose/response relationship between ACh inhibition and intravenously administered donepezil. This study suggests that donepezil at 100 µg/kg inhibits about 30% of the acetylcholinesterase activity and donepezil at 250 µg/kg inhibits about 55% of the activity in living monkeys (Shiraishi et al., 2005). In order to induce even greater inhibitory effects with donepezil, we applied 400 µg/kg donepezil in the current study. It is reported that the donepezil concentration between blood and brain becomes constant within 5 min after intravenous injection in mice (De Vos et al., 2000) and the maximal increase in intracerebral ACh levels resulting from ACh inhibition by donepezil occurs as early as 14 min after intravenous injection of donepezil in monkeys (Tsukada et al., 2004). Even though these previous reports support our assumption that the concentration of donepezil in the brain reaches a steady state rapidly enough before the indices were measured (15 min) in our study, donepezil could not completely, but only partially, recover the morphine-induced respiratory depression. Therefore, further studies will be needed to evaluate the dose-dependent effects of donepezil on morphine-induced respiratory depression. 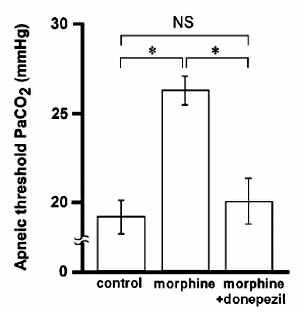 In the present study, morphine-induced deterioration of apneic threshold is recovered by donepezil. Berkenbosch et al. (1994) have shown that morphine increased the apneic threshold and physostigmine decreased this morphine-induced increment of the apneic threshold without any change of the C02 sensitivity of the central and peripheral chemoreflex loops. These results are consistent with our results that donepezil recovered morphine-induced increment of the apneic threshold, and recovered morphine-induced ventilatory depression. Thus, not only physostigmin but also donepezil might take action on the respiratory neuronal network by increasing the amount of ACh in the respiratory center. In the previous studies, some drugs and substances have been indicated as candidate antagonists for opiate-induced respiratory depression (Weinstock et al., 1980; 1981; 1982; Snir-Mor et al. 1983; Willette et al., 1986; Elmalem et al., 1991; Berkenbosch et al., 1994; Ballanyi et al., 1997; Owen et al., 2000; Manzke et al., 2003; Lalley, 2004; 2005). Among these candidates, physostigmine is the only clinically used drug that can pass the blood brain barrier, it is rapidly metabolized to eseroline and two other metabolites (Giacobini et al., 1987). Therefore, Bourke et al. (1984) concluded that physostigmine was ineffective as an antagonist for opiate-induced respiratory depression. However, as we have shown in the present study, donepezil may represent a strong candidate as an antagonist of morphine-induced respiratory depression. Furthermore, donepezil has numerous advantages for patients using morphine. Donepezil appears to improve sedation and fatigue in patients receiving opioids for cancer pain (Bruera et al., 2003; Slatkin and Rhiner 2003) and prevents the addictive effect of morphine (Hikida et al., 2003). As an added advantage, the diarrhea induced by donepezil as a side effect (Birks 2006) might cancel the constipation which is a side effect of morphine. Furthermore, donepezil might enhance the analgesic effect of morphine because spinal ACh enhances the analgesic effect of systemic morphine (Chen and Pan. 2001). Further studies are needed to evaluate these potential advantageous effects of donepezil in its interaction with morphine. Pancuronium is used as neuromuscular blocking agent in the present study. In our previous study (Sakuraba et al., 2003), neuromuscular blocking agents themselves have inhibitory effects on respiratory activity in the isolated brainstem spinal cord of neonatal rats that have no blood brain barrier. However, neuromuscular blocking agents can hardly pass blood brain barrier (Fahey et al., 1990; Werba et al., 1992; Fuchs Buder et al., 2004) and thus can be thought not to affect respiratory activity. In summary, the inhibitory effects of morphine on respiratory rate and amplitude were partly recovered by donepezil in the anesthetized rabbit. Also, donepezil recovers the morphine-induced increase of apneic threshold. Thus, these effects might be caused by donepezil-induced increment of ACh in the respiratory neuronal network. This research was supported, in part, by the Keio Gijuku Postgraduate School Fund for the Advancement of Research, the Keio University Grant-in-Aid for Encouragement of Young Medical Scientists, and a Grant-in-Aid for Scientific Research from the Japanese Ministry of Education, Science and Culture.